It has been known that many diseases such as cancer are involved in blood and lymphatic vessels, which are consequently regarded as major therapeutic targets in recent years. However, with a limitation of conventional experimental platforms including animal model and 2D cell culture model, it is difficult to conduct research on a complex biological phenomenon in a multi-variable control system. To overcome the limitation, we established perfusable and physiologically relevant 3D microvasculature by cell culture technique using ECM hydrogel inside the microfluidic platform. Now, we are working on modeling unique microvascular structure such as blood-brain barrier by co-culturing multiple cells, expecting it to be accompanied by their specific physiological functions. ​Our 3D constructed blood and lymphatic vessel will be solely analyzed or be integrated into diverse organ-on-a-chip platforms to investigate physiological, pathological processes and to conduct high-throughput drug screening. The microvasculature plays a key role in every organ to define microenvironment of tissue through controlling homeostasis, permeability or immune function, therefore it has been issued through the organ-on-a chip field. As numerous in vitro culture systems including previous organ-on-a-chips have achieved a little success in terms of continuous supply of nutrients which is a crucial factor for stable and long lasting in vitro culture systems, reconstruction of vascular network on microfluidic chip has been inevitable. Our group established perfusable and physiologically relevant 3D microvasculature by cell culture technique using ECM hydrogel inside microfluidic platform. 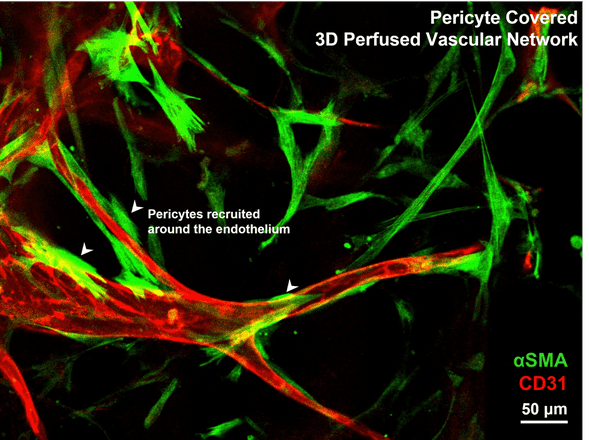 This achievement has jumped over the limitations of previous non-perfusable or 2D vascular models and made possible to closely mimic in vivo features of vasculature. Formation of new blood vessels, termed angiogenesis, is central for diverse biological processes during postnatal physiological process, inflammation and tumor microenvironment. Angiogenesis related diseases are prevalent globally, especially cardiovascular related disorders and cancer being the leading causes of the mortality worldwide. ​A huge amount of studies have been done on the vasculoprotective role of high-density lipoprotein (HDL), but its role in angiogenesis is yet to be fully elucidated with various disease conditions. We are focusing on probing the effect of HDL on angiogenesis using microfluidic chip. We expect this study will provide better understanding of HDL-angiogenesis and microfluidic nanomedicine evaluation for drug delivery. ​Currently, we are working on modeling unique microvascular structure such as blood-brain barrier by co-culturing multiple cells, expecting it to be accompanied by their specific physiological functions. As co-culture with pericytes and analysis of their effect on both microvessel structure and function has succeed, our next step is to apply more complicated but more biologically relevant components on our own microfluidics platform. Furthermore our device is able to create cancer microenvironment containing vessel network. This platform would provide better understanding on pathological angiogenesis, cancer intravasation, cancer-associated fibroblasts(CAFs) or epithelial-mesenchymal transition(EMT) studies.